The February issue of Bike Buyers Guide is shops nationwide from today. As ever, it’s packed with bike news and reviews and of course the MAG Ireland column. This month we look at how things can go very wrong when an organisation gets fixated on the idea that motorcycles are a bad thing and how that affects us as riders every day. Read our take on it in this month’s issue of the magazine. 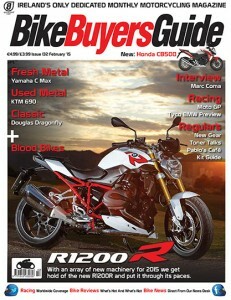 Also in this issue, Roland Brown rides the all new BMW R1200R. Cormac Ryan Meenan looks forward to another great year in Moto GP while Aidan Lynam gives us the low down on the new BMW team. Elsewhere, there’s a review of the new A2 License friendly CB500X while a rather tidy KTM 690 Duke is the used metal for this month . You’ll also find the usual regulars including the kit guide, Pablo’s Café and Toner Talks plus of course the MAG Ireland page.